New Year Resolutions -- Why do we make them? New Year Resolutions -- why do we make them? I couldn't pass up the opportunity to share this fabulous article with you. Ed Chinn is a fellow Texan and a noted author (read the credits at the end of this article). If you've not yet made your new year resolutions, I hope you find it as inspiring as I did. Have you noticed that the dead of winter is not the most ideal time for making great change in life? The weather tends to keep us somewhat immobile (most people don't jog when it's 14 below zero). Our bodies capture and stockpile calories, making weight loss more difficult. In fact, the whole rhythm of life seems to be in a downbeat of hibernation. The release of new life in the spring would seem to be a more ideal time for change. Yet, making resolutions for an improved life is a January 1 ritual for most people. I suppose one reason is because, no matter how many years roll by, "January" always marks the border to a new beginning. In that sense, each year trips back to zero. Start over. I believe the larger reason is found in our human need for a clean slate. We all yearn for a brand-new and pristine condition. Humans, regardless of their culture or value system, carry an intrinsic need for forgiveness and a new beginning. So, an annual "starting gate" reinforces the ideal of forgiveness and renewal. This is my time for rejuvenation! We see it as a time to shed our old skin (often that is very literal . . . weight loss is the number one New Year's resolution). Throughout my years and careers, I have carefully observed different approaches to life. In fact, watching people navigate change is almost an obsession with me. So, I have learned some things about New Year's resolutions. I hope these "travel tips" will be helpful if you make resolutions. Be You This may seem simplistic and unnecessary. But, we live in an age of such relentless conforming pressures, that too many people borrow their actions and attitudes from others. For example, if our own social network is intensely materialistic, then we feel pressed into compliance with externally-defined objectives ("You know, honey, we need to update our kitchen this year," or "With the kids growing up, we really should invest in a new minivan . . . "). We all tend to compare -- and, therefore, conform -- ourselves to others. One of the problems with "celebrity culture" is the imposition of false purpose. It essentially says, "Your real life is boring and unimportant. But, you can design and have a new and glamorous life." That is why I believe the starting point for life-improving resolutions is to "locate" yourself. Who are you? What are you graced and equipped to do in life? Think large I believe the best New Year's resolutions spring out of a large and long view of life. What really matters to you? How do you see your legacy? Do you have a sense of calling? If so, what are you called to do? It is always better (and easier) to work within the large scope of God's call and blessing than to operate outside it. Focus on details Once you have a large view of God's call and favor on your life, you can work out the details. In other words, you can move from the "macro" of the large canvas to the "micro" of particulars. Identifying the large themes of your life will always help to move into wise and realistic details. For example, if your life's purpose and joy revolve around caring for those who cannot care for themselves, look for reasonable places of service like hospitals, homeless shelters, or jails (NOTE: obviously, you must obtain wise counseling and professional training prior to serving in those environments). From there, you can develop intelligent goals -- number of days per month for this chosen work, number of people to serve or amount of money to contribute, etc. Be specific and brief "Improve my health" is not a good resolution. "Lose 1 pound per week" is a good one (don't think that is too small; how many people lose 50 pounds per year?). 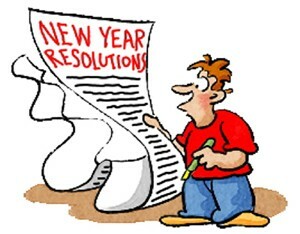 Resolutions must be simple, clear, realistic, and limited if they are to have any chance for fulfillment. I can almost promise you that a list of 20 targets, or even 10 grand goals, will quickly become discouraging and then discarded. The lists are too daunting. But, settling on 5 reasonable, active and attainable resolutions will usually find some success. Pray over the list This is the most important step. Let me tell you why. The truth of Christian life is that Jesus lives through us. In a beautiful conundrum, He is the designer, the power, and the provision for new life. Our primary role is to die to ourselves. So, developing a list (of any kind) should be a prayerful meditation rather than a methodical exercise. It is a matter of integrating His will into your daily walk more than developing a "wish list" for a preferred life. Let me give you an example. One year ago, Joanne and I felt like the Lord invited us to strengthen relationships with a few people whom we knew only casually. We weren't tired of old friends and just wanting a "new and improved" group; we really heard it as something He directed. So, we listed those who were on our hearts and submitted it to the Lord. We regularly prayed over it. But, we didn't lay out any kind of strategy. In fact, we did very little about the list (beyond occasional email messages or a Saturday morning Starbucks run). We prayed over the list. In writing this, I looked up at the list of 16 names. For the first time, I realized that nine of them have become good friends this year. All of that happened through an energy which came from the Lord, not from any brilliant or heroic efforts on our part. One year from now, your life will encompass new experiences (some painful, some delightful), new friendships, new opportunities and challenges and new ideas. Whether you are religious or not, most of those will flow from your God-designed destiny. They will, in a sense, "invade" your life from outside yourself. Most will not be the result of any creative "blueprints for change" which you designed or initiated. Therefore, the best resolution for any season of life is simply to get in sync with the higher rhythms and reasons of your life. Contemplate the path which seems illuminated by God's purpose and favor. His plans are unique for each individual; He never seems to operate according to conventional wisdom or tradition (remember that Red Sea thing? That was not only brilliant, but He only did it once!). Finding that deliciously unique and personal path is one of the great challenges and fulfillments of life. As you do, you will also find that a "work list" emerges very naturally out of that path. Jesus said, "I make all things new." (Revelation 21:5). The real issue is not resolutions for a new year, but finding the state of "all things new." When we do, each year becomes another adventure in letting go of the old and crossing over into the new. When we know His newness, every day is a clean slate. Ed Chinn is an organization consultant and free lance writer from Fort Worth, Texas (edchinn@charter.net). His work has appeared in the Christian Science Monitor, The Washington Post, OpinionJournalcom and the Fort Worth Star Telegram. Copyright December 2007 Focus on the Family. All rights reserved. International copyrights secured. We all need a "do over" -- New Year Resolutions are a great way to do that. Ed Chinn's suggestions for making new year resolutions are, in my opinion, right on point. The desire to make new year resolutions is global and crosses all cultural boundaries. That being said, some people simply don't make new year resolutions. Why? For some, it's a fear of failure, for others, they hesitate making new year resolutions because they have given up on themselves. They basically have told themselves "This is just the way I am." I hope that's not you. If it is, make a new year resolution to change your attitude toward yourself! While weight loss may be at the top of most new year resolutions lists, getting organized is also a very common goal to set. If you feel you need help with setting and accomplishing new year resolutions, check out the other helpful articles on www.straighten-up-now.com. Don't see what you need? For help with New Year Resolutions or other help, please use the Contact Me form and submit your question. I'm here to help you with your New Year Resolutions (or anything else)! Happy New Year!